Here is an interesting piece in the Telegraph. "They want Herman Van Rompuy to be able to address the General Assembly as a head of state, and to create a seat for Baroness Ashton, the EU’s foreign minister." Also; "The European Constitution Lisbon Treaty, which came into effect on 1 December 2009, gave the EU “legal personality”: that is, the right to sign treaties; it also created a diplomatic corps to negotiate those treaties and regulate the EU’s relations with third countries." Where does that leave us in the UK ?? Any suggestions as to future scenario's, especially Euro membership for UK + of course house prices !!! The state as a person of international law should possess the following qualifications: (a) a permanent population; ( a defined territory; © government; and (d) capacity to enter into relations with the other states. The EU has qualified for decades on (a), ( and ©. Now it has ticked the final box. The European Constitution Lisbon Treaty, which came into effect on 1 December 2009, gave the EU “legal personality”: that is, the right to sign treaties; it also created a diplomatic corps to negotiate those treaties and regulate the EU’s relations with third countries: the European External Action Service. Now, Eurocrats want formal recognition from the United Nations. They want Herman Van Rompuy to be able to address the General Assembly as a head of state, and to create a seat for Baroness Ashton, the EU’s foreign minister (hat-tip, EU Observer). Not everyone is happy with the plan. Many developing countries complain that it would be wrong to accord the EU privileges that are not enjoyed by other regional associations. Indeed, opponents of the scheme commanded a majority when the issue came to a vote. But the EU is continuing to press its claim and – given that it is the original patron and sponsor of most of the other regional blocs – it will surely be only a matter of time before it gets its way. I shouldn’t be surprised if, as part of the negotiations, Eurocrats offer to exchange the British and French seats on the Security Council for a consolidated EU seat, as long demanded by the two main blocs in the European Parliament, the socialists and the EPP. And British politicians still talk about Europe “coming our way”. Their next step is to abolish all Sovereign Parliaments, take power from our own Foreign Secetary and let Nah Nah Nah Nah Ashton`s Stormtroopers run the International Show which they can do under The Lisbon Treaty. He looks like the Avatar of Daft Boy a member of this Forum. and to create a seat for Baroness Ashton, the EU’s foreign minister." Was a past Treasurer of CND whose Leader was a Communist, she still refuses today to say where their funding came from. A nobody who married well into the close Blair mob, elevated to the Lords solely to push through the Lisbon Treaty before the British Public was aware what was happening, even GB got her name wrong at the EU. Chosen by men over dinner in a masonic type meeting. To date she has come across as right out of her depth and has been criticised by the MEPs in the EU Parliament. That's some awesome photoshop skills you have there. Made his face look real ******ing weird like montgomery burns chewing on a snooker ball. Now it has ticked the final box. The European Constitution Lisbon Treaty, which came into effect on 1 December 2009, gave the EU “legal personality”: that is, the right to sign treaties; it also created a diplomatic corps to negotiate those treaties and regulate the EU’s relations with third countries: the European External Action Service. That'll be the treaty they said was of no great significance when reneging on the promised UK referendum - but signing it anyway. We have the zirp = zero interest rate policy for the economy and the zdp = zero democracy policy for the politics. Chosen by men over dinner in a masonic type meeting. Let's face it, with or without EU, that's how politics has been done for centuries. Democracy is an illusion, it's all decided over dinner at masonic type meetings by unelected people, the elected people simply follow orders from these meetings. How does English Law recognise European Law ? By bending over and taking it I think. The EU supercedes our law unless we opted out. We can only opt out of one random thing every 200 years and basically they own us. See how they've been critical of France evicting Roma? They'll be telling us we have to keep all the asylum seekers next. But we have the Queen who has the ultimate power and her Privy Council. She has quite recently and publicly indicated that this this ancient and well established structure is very mush functioning. as intended. When she comes out of the palace screaming "Off with their heads" I'll take more notice. Another, recently published, angle on what's happening. Sometimes it's difficult to know what, if anything, to believe. Free-Market Analysis: It is likely confusing for most people to understand what is going on regarding the British financial system and Europe. On the surface it looks like a takeover of the British system, with the important regulatory elements migrating to Brussels. But this is a misperception from our point of view. SKETCH: FEAR AND LOATHING IN THE EU's TOWER OF BABEL. One of the early 1960s movie epics had an end sequence in which Roman Senators squabbled about how to run the empire. As the camera moved above their heads and tracked backwards, the Ostrogoths were visible breaking through from the Roman suburbs. It's a bit like this in the EU's corridors of power at the moment. 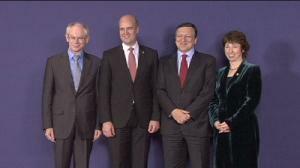 Berlin spoke out yesterday about the lack of progress by Council President Herman Van Rompuy and his taskforce for economic governance. The is bad news for Rompuy, as the Germans have been his strongest allies until now. But Deputy German Foreign Minister Werner Hoyer told the media, "This dossier is too important to be treated on the basis of nebulous texts." Germany backs the idea of a suspension of voting rights in the Council for states that break budget rules, which is likely to require treaty change. Britain won't have any of that. But Herman himself is occupied with other matters of far greater importance. Insiders accuse him of enacting a "power grab" over foreign policy - by supporting a French proposal to set up a "special task force" on strategic relations that would rival the Catherine Ashton's new EU foreign office, the European External Action Service (EEAS). Catherine Ashton is due to announce the first 25 top diplomatic appointments and the budget for the EEAS later today. This must be why the Commission wants a bigger budget next year, but they have at last found a supporter: Berlusconi weighed in from his lofty pinnacle atop the Italian 135% deficit Everest to strongly support the budget increase. Urgent negotiations are under way among the Rumpuys to try and get Silvio to shut up about it. In the light of Belgian negligence, influential German newspaper Handelsblatt reports that the European Commission will separately table a proposal on 29 September. This will demand fines be imposed on member states failing to pursue reforms to boost their economic competitiveness. Italy, France and Poland also have reservations about stronger sanctions. And once again, Britain won't wear it. Allegedly. If it's unhappy with Herman, however, the German Government is mad with Manuel. Rheinische Post describes Commission President José Manuel Barroso as the "expenses king" of the European Commission, noting that he spent more than €730,000 on travelling and representation costs last year. Barroso's new communication strategy will involve a team of photographers and speechwriters accompanying him around the clock. German FDP MEP Silvana Koch-Mehrin is quoted as saying: "Photographers and a personal camera team for Barroso? That is for me bordering on megalomania." France is bordering on some form of reality, but still stinging from the attack on its Roma expulsion campaign. EU Justice Commissioner Viviane Reding yesterday said "this is a situation I had thought Europe would not have to witness again after the Second World War. I am personally convinced that the Commission will have no choice but to initiate infringement procedures. French Europe Minister Pierre Lellouche is quoted in EUobserver saying: "This is not how you speak to a major power like France, which is the mother of human rights". He didn't mention that France also has the mother and father of all deficit problems (the fastest-growing in the Union), but fear not fellow Europeans, for Christine LaGarde is on that case. She says it will be solved by growth, but she has at last tired of making growth forecasts with which the French economy takes issue - and thus turned to wider problems. Christine now says that the eurozone's drive for new fiscal rules and sanctions has run into "very difficult" legal obstacles and political objections from non-eurozone members in Eastern Europe. She said that, although there is scope under existing treaty provisions for the 16 eurozone members to draw up their own procedures, "We have the other 10 members asking 'Why should you exclude me? Why am I not part of the club?' The whole question of sanctions, the timing and pattern of sanctions, is at stake here." Actually Christine, I think most people decided some time ago that the stakes are considerably higher than that - chiefly because the standing of this bloated, pompous suprastate has never been lower. At the last count this looks to me like three different groups all aiming for EU-wide economic governance - but getting nowhere. Awareness of this was confirmed yesterday when the EU suffered an embarrassing defeat at the United Nations: it pressed for rights already enjoyed by full UN members. Oddly enough, the Council there turned it down flat. Imagine that. It's got to a point where there's so little up grabs in politics that it doesn't matter to the man on the street. Look at the differences between the big 3 at the last GE, you couldn't stick a fag paper between where the last one ended and the next began. There are bigger difference within proper parties than there are between the liblabcons. So when the EU start extending their powers and deciding for themselves what's going to happen to this country the British people just let them get on with it because we've become accustomed to being frozen out of the political process. Even hardened eurosceptics havn't really got this, Daniel Hannan for example wants to take all the powers away from Brussels and hand them down to local councils. So we end with up a 30-40 EU style bureaucracies instead of 1, and he promotes this under his banner of "localism". When these people finally realise that democracy should be used as a last resort due to its coercive nature we'll finally start getting some of our hard won -and easily lost- freedoms back. Until then it doesn't matter what commitee ends up making the important decisions, because they're all as remote and aggressive as each other. I'll recognise the EU as being 'in a state'. Will that do?